Durham, North Carolina is home to some of the most visually exciting artists and art galleries in the South. From pottery, paintings, sculptures, and visual art displays by local artists to world-famous exhibitions from across the globe, get your art fix at every corner of the Bull City. Visit these local art galleries and showcases year-round for true inspiration. Some of their permanent and many of their visiting collections of contemporary art exhibits are focused on interdisciplinary art from artists of African descent. Pulling in visually compelling pieces centered around music, theater, environmentalism, and cultural identity from both the African continent and the American South, the Nasher Museum draws out our curiosity and asks us to self-reflect at every turn. Click here to visit the Nasher Museum of Art at Duke University website. Pleiades Arts is located at the Five Points area in downtown Durham by Pizzeria Toro and Cupcake Bar as part of a perfect Bull City downtown date triple threat. Spark the conversation in between dinner and dessert with engaging works by some of the Bull City’s best and brightest local artists. Founded in 2013, Pleiades Arts engages and inspires with a socially focused drive and a constantly rotating menu of mixed media artist galleries every 6-8 weeks, a new upstairs artist every month, educational events, monthly receptions every Third Friday (from 6-9 pm), and a growing reputation of civic outreach partnerships. Check out their upcoming exhibits and events. Click here to visit the Pleiades Arts website. Downtown Durham’s historic Hill Building was transformed in 2015 into the 21c Museum Hotel, bringing global ideas to the local community through modern art. You don’t even have to book a room to view a wide selection of sculptures, mixed media artwork, videos and more. 21c’s seasonally rotating galleries are open to the public 24/7, so walk in any time day or night with a date or your favorite people. The 21c building itself is divided into several reimagined quarters, including a bank vault that serves as a lounge area on the bottom floor, a museum gift shop with a Virtual Reality simulator on the top floor, and thought-provoking sculptures of animals using every-day found objects at the hotel’s Counting House Restaurant and Bar. 21c is also host to a number of banquets, dance parties, and fundraisers throughout the year. 21c is the definition of exhilarating! Click here to visit the 21c Museum Hotel website. Voted “Best Art Gallery” in Durham Magazine’s 2017 “Best of Durham Competition,” the Durham Arts Council’s building is loaded with four exhibit spaces worth of paintings, ceramics, fiber arts, glass art, jewelry, digital photography, and other mixed media from Durham and the Triangle’s most talented artists. Durham Arts Council’s building consists of the Allenton Gallery, the Semans Gallery, the Ella Fountain Pratt Legacy Gallery and the SunTrust Bank Galleries occupied by the Durham Art Guild. Every year, the Durham Arts Council produces CenterFest, Durham’s annual street arts festival, which occurs the third week of September. Click here to visit the Durham Arts Council website. Wandering through downtown and beyond, you will notice vibrant murals (26 to be exact) adding a color and beauty to dozens of store-fronts and historic building walls. In collaboration with Duke Arts and Artstigators, Mural Durham is a living archive that captures the growing number of murals across Durham. Depicting everything from historic Black Wall Street and classic Durham advertisements, to abstract street-art graffiti and more, every mural is a true work of art. Join in on Durham Mural Bike Tours the first Saturday of every month (May-November) from 10-11:30 am. Starting at Durham Central Park at 501 Foster Street, you’ll get a 90-minute tour of 13 amazing larger-than-life murals that decorate more than 5 miles of the Bull City. Bikes and helmets not included. 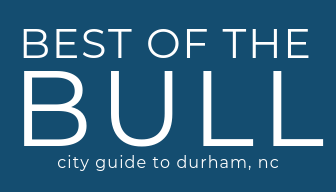 Get your Mural Durham Mural Finder booklet from the Durham Visitor Info Center (212 W Main Street #101) downtown and share your favorite mural shots on your Instagram feed with the tag #MuralDurham. Share 5 to get a special prize from the Visitor Center. Visit the Mural Durham website.